Science tells us with increasing precision that health and well-being in American communities is shaped by a complex web of determinants and contributing factors extending far beyond the reaches of the medical care sector. The physical environment, human and social capital, and economic opportunities and constraints exert a profound influence on health at molecular, person and population levels. One consequence of this fact is that actions taken outside of the health sector can have profound and even profoundly unintended consequences on health and well-being, and these effects are often distributed unevenly across society. Efforts to solve a transportation or housing or education problem, for example, may shift exposures to health risks and protective factors in ways that persistently alter the health trajectories of affected population groups. Economists and other social scientists refer to these phenomena variably as interactions, synergies, externalities, or spillovers across sectors, institutions and systems. 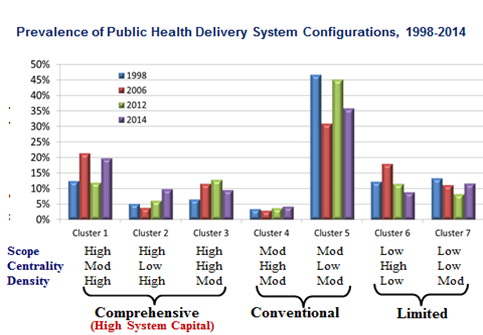 Unfortunately, our knowledge about these system spillovers is incomplete and still evolving, and so our ability to manage these spillovers in ways that optimize population health outcomes and minimize health inequities remains quite limited. The result is our current constellation of fragmented approaches for delivering and financing medical care, public health, and social and community services in the U.S., and our many missed opportunities for collective actions in improving health. Earlier this month the Robert Wood Johnson Foundation (RWJF) announced a new funding opportunity to help build scientific knowledge about how to solve these systems problems as part of its $25 million investment in research to build a Culture of Health. 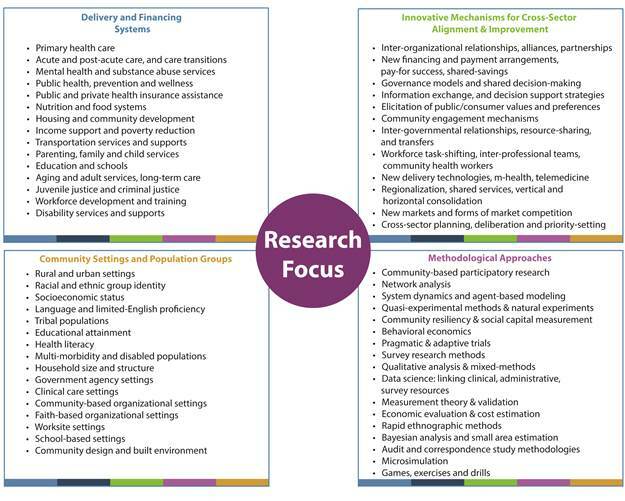 The Systems for Action research program will develop a rigorous body of applied scientific work that reveals how best to align, coordinate, and integrate the many delivery and financing systems that shape health and well-being in American communities, including but not limited to the medical and public health sectors. This new work is not starting from scratch, but rather it builds from the strong foundation of health services research (HSR) and public health services and systems research (PHSSR) that has helped us understand and improve delivery and financing systems found within the health sector. We invite you to review the research agenda developed for this exciting new program, along with the new funding opportunity announcement. Join us this Friday December 18 from 1-2pm for a webinar on the new research opportunity (registration required). Amid the hustle of the APHA Annual Meeting this week some may have missed the striking new paper on the declining health status of middle-age white Americans by Princeton’s Anne Case and her colleague/spouse this year’s Nobel prize winning economist Angus Deaton. Making elegant use of some of our key national health datasets, the researchers show that a confluence of mental health problems, chronic pain, inability to work, and substance abuse track closely with an escalation in suicides, alcohol and drug deaths since the turn of the 21st century. Most shockingly, these trends have been sufficiently persistent and large to drive up all-cause mortality at midlife among white non-Hispanic Americans during the period 1999-2013. The dramatic rise in mortality and midlife distress among those age 45-54 was concentrated among those with fewer years of education. The rise in mortality and decline in life expectancy among such a sizable demographic group over a relatively brief time frame is nearly unprecedented in the 21st Century American population. Case and Deaton note that only the HIV/AIDS epidemic has done this much damage to public health in modern times. The demographic timing of this health shock during prime working and earning years also means that the economic consequences are considerable and likely to contribute to a sluggish U.S. economy. These new findings on the declining fate of white mid-life Americans, combined with our existing knowledge about the persistent health disparities faced by racial and ethnic minority groups in the U.S., should be a call to action for those of us who study public health delivery and financing systems. It is not clear who if anyone is being well served by our status quo approaches to protecting and improving population health. Surely we can find ways of retooling the U.S. public health system so that it becomes more responsive and more effective in detecting and addressing key population health dynamics. Such retooling will require strengthening the public health system’s engagement with and influence on larger social, economic, and environmental systems that shape health and wellbeing, which are likely at the heart of America’s midlife crisis. Check out our new Systems for Action Research Agenda for ideas on how systems and services research can help us get there. I invite you to comment on this blog, tweet at me, nudge me on linkedin, and follow my research archive. A Decade After Katrina: Are We Better Prepared, and How Can We Know? National Preparedness Month is upon us, and as we pass the 10 year anniversary of Hurricane Katrina, policy and public attention turns to the question of whether we are better prepared today than in years past. Does the nation have the necessary capabilities to blunt the health and economic consequences of disasters, pandemics and other large-scale public health emergencies? 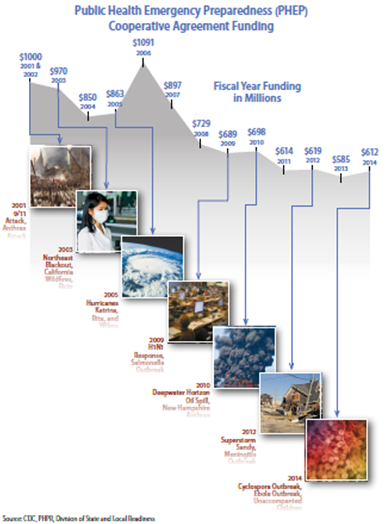 Looking just at the money, we know that federal outlays for public health preparedness and response programs have been in steady decline since Katrina (see figure). And our best data sources suggest that state and local government expenditures dedicated to public health preparedness are negligible. So what does this mean for preparedness levels across the US? A new tool for measuring the nation’s preparedness and health security capabilities has been in development over the past several years: the National Health Security Preparedness Index. An initial version of the Index was released in December 2013, and the second, current version was released a year later in December 2014. The Index is definitely a work in progress as the science and practice of preparedness continues to evolve, and particularly as we learn how to measure important preparedness constructs and capabilities such as those outlined in the National Health Security Strategy. The Index is currently inviting public comments regarding these proposed updates to the Index methodology and measures. You can access the report on Index recommended updates and the public comment form here. The public comment period extends throughout National Preparedness Month and ends on September 30, so let us hear from you. The students are back at my door, punctuating the end of an active summer conference season for those of us who study public health delivery systems, policy and economics. This post highlights a few of the studies presented during the summer meetings just in case you missed some. I find these meetings invaluable not only for scientific networking and idea-generation, but also for the early access they give us to newly emerging findings and novel applications of research methodologies. The journal articles will come, but for now they are still months away or more. I have no time to be comprehensive here given the unfinished manuscripts on my own desktop, so this post dashes unabashedly through just a few of the meeting sessions in which I had a hand. But in doing so, I hope to pique reader interest in browsing other sessions and studies featured at these meetings. Particularly notable in this session, Case Western’s Scott Frank and his colleagues present a comparative analysis of community health assessment and improvement activities led by hospitals vs. public health agencies in Ohio, which won AcademyHealth’s award for Best Research in the Public Health and Population Health category. This study, conducted through our RWJF-supported Public Health PBRN Program, found substantive differences in the types of health conditions and intervention strategies targeted by the two types of organizations, suggesting that there are some benefits (complementarities) when each type of organization leads their own assessment and planning process, along with some missed opportunities for coordination. A related study featured in this session by Emily Johnson and colleagues at the University of Colorado finds that state laws requiring hospitals to publicly report their expenditures on community benefit activities results in significantly larger expenditure levels for both charity care and nonclinical activities. One of our RWJF-funded Postdoctoral Scholars in PHSSR, Sharla Smith from the University of Kansas Medical Center, rounded out the session with her study of how public health inter-organizational networks respond to economic shocks and governance structures. Using data from our National Longitudinal Survey of Public Health Systems, she shows that governance exerts a stronger influence on inter-organizational connectedness than do resource constraints. For the second year in a row we organized a methods workshop on social network analysis in health services research, which featured some innovative research on physician networks using claims data by Harvard’s Bruce Landon, along with studies of interdisciplinary care teams by the University of Minnesota’s Doug Wholey, and our own work using network analysis to evaluate multi-sectoral public health delivery systems (see figures). We also joined colleagues at RWJF in presenting a session on the three new research programs being implemented as part of RWJF’s Culture of Health action framework. These sessions represent only a small fraction of the new research on public health services and systems presented at the ARM, including an entire adjunct Interest Group Meeting on public health systems research. A month later many of us took our science abroad for the World Congress of the International Association for Health Economics in Milan, where the conference theme of nutrition and economics revisited the famous Latin maxim “De Gustibus Disputandum Non Est” – should preferences be treated as fixed or endogenous in health economic research? The conference featured a dizzying array of new studies conducted around the globe on public health issues that include taxes on sugar-sweetened beverages, enhanced food labeling requirements, incentives for fruit and vegetable intake, the economics of disaster preparedness, novel family planning interventions, and substance abuse prevention policies. As part of our panel on the economics of public health delivery, Johns Hopkins economist David Bishai presented new research demonstrating how county-level public health expenditures reduce disparities in mortality rates between counties with high and low African American populations. We followed this with an updated analysis of how Medicald spending and public health spending interact at both state and local levels to influence population health, resulting in some unintended consequences involving crowd-out. Maryam Nejad at the Institute for the Study of Labor rounded out our session with an analysis of how suburbanization fuels obesity rates over time, using people who move from city centers to the suburbs to identify these effects. The interplay of studies conducted in the U.S., in other high-income countries, and in low and middle-income countries at this meeting allowed for particularly insightful scientific discussion and debate. August brought us to the 7000+ island nation of the Philippines and its capital city of Manila for the 2015 edition of the Global Forum on Research and Innovation for Health. Sponsored by the Council on Health Research for Development, this meeting pulls together a large and diverse collection of several thousand researchers, representatives from health industries, and policy officials from national ministries of health, finance, science and technology. The Global Forum provides a platform for sharing research on strategies for improving health and economic development in low-resource settings, with a focus on low and middle income countries and their relationships with more advanced economies. As part of a session on public-private partnerships, we shared updated research on the health and economic value of multi-sector alliances for public health delivery in the U.S., using data from the National Longitudinal Survey of Public Health Systems. Along the way we shared lessons learned about how to support productive research collaborations using the mechanism of practice-based research networks (PBRNs), and also reflected some of our work related to disaster risk reduction as part of the National Health Security Preparedness Index. Many other fascinating sessions at this meeting featured research on disaster preparedness, non-communicable disease control, harnessing big data in health, and building flexible research infrastructure. As did Milan, Manila left me surprised and intrigued by the range of research studies on public health delivery, financing, and economics that are now underway in African, Asian, Latin American, and Caribbean countries, among other settings. Clearly there is much to be learned by comparing the structures, processes, and outcomes that play out across these diverse systems and population groups. Of course these meetings over the last three months are far from the only venues where good science on public health delivery, policy and economics were discussed this summer. Not included in this post, but not to be overlooked, is the venerable NACCHO Annual Meeting that convened in July with an active research track featuring studies from many colleagues in PHSSR. Don’t make us wait for the journal articles. If you saw some research not-to-be-missed this summer, you can post a comment about it below, nudge me on LinkedIn, tweet at me, or just show up during my office hours. My own research presentations and products always can be found in the research archive. This week we lost one of the great public health services researchers of the 20th Century in Dr. C. Arden Miller, who died on Sunday after more than a half-century of scientific inquiry to improve population health. His research spanned a wide continuum: vaccine development, reproductive health services, infant mortality, and—for much of the last three decades of his career—public health delivery systems. Miller believed that a key to improving America’s sub-optimal and inequitable health status lies in discovering ways of improving the fragmented and diffuse delivery systems for prevention and public health initiatives. And so early in the 1970s he began using the theories and methods of health services research to study public health institutions and delivery systems, while most of the HSR field focused narrowly on medical care delivery and financing. Miller’s work provided the foundation for much of the contemporary research on public health delivery and financing, including our national surveys of public health delivery systems and our methods for measuring public health system performance. Indeed, his enthusiasm for this area of inquiry is what attracted me to the PHSSR field as a graduate student from more “mainstream” research interests in health care financing and care management. Methodologically, Miller taught us that one can learn only so much about delivery systems from afar through surveys and administrative data. At some point, one must go down to the factory floor, observe the operations and talk to the people who do the work of producing population health. 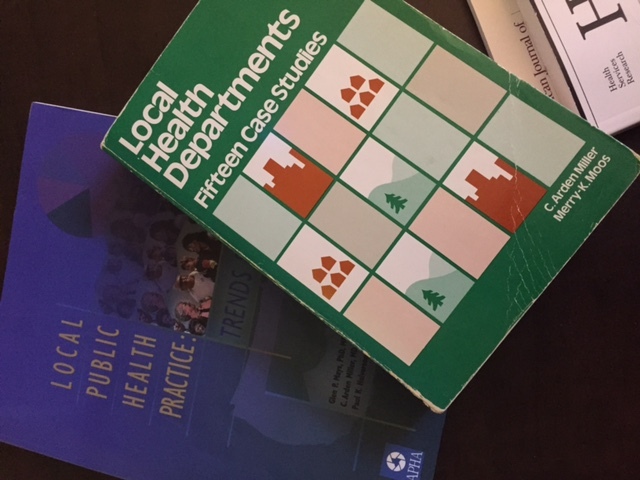 His comparative case studies of U.S. local health departments (books pictured) and cross-national comparisons of maternal and child health systems (featured in a 1994 New York Times article) are powerful examples of the merits of a mixed-methods approach. Miller’s long legacy of action-oriented public health research lives on in the work of the many, many researchers and health professionals whom he taught and mentored. Farewell and God Speed Dr. Miller. Usually when a public health agency makes a front-page article in the New York Times, it is not good news for the public’s health. Not true for this week’s NYT feature on the Colorado Department of Public Health and Environment and its six-year “experiment” with providing free long-acting reversible contraceptives (LARCs) to low-income teenagers. The article touts a 40% decline in the teen birth rate and a 42% reduction in the teen abortion rate since Colorado’s innovative Family Planning Initiative began in 2009. But how much of this decline can be attributed to the program? It turns out this question is not so easy to answer because—contrary to the implication in the opening sentence of the New York Times article—a true experimental research design was not used in Colorado. Attribution is clouded by the fact that teen births have fallen across the country during this time period, partly due to the economic downturn. Fortunately, we have a new study by Jason Lindo and Analisa Packham at Texas A&M that provides strong quasi-experimental evidence about program impact, which surprisingly was overlooked in the NYT article. But this blog will give the researchers their due along with the good people in Colorado’s public health agency. To derive estimates of causal impact, Lindo and Packham identify all the U.S. counties outside of Colorado with an operational Title X family planning clinic, and use these settings as a nonequivalent contemporaneous comparison group for the Colorado counties where the program was implemented. Colorado’s program steered resources to the state’s 37 Title X clinics to deliver LARCs free of charge to eligible clients. The researchers use difference-in-difference (DND) estimation to control for any systematic differences between the Colorado and non-Colorado settings that might otherwise confound the results. Even better, the empirical specification allows the program’s effects to vary across years while also controlling for state-specific trends in teen births, further reducing the risks of bias due to confounding. The results suggest that Colorado’s program reduced the teen birth rate by approximately 5% in the four years following implementation. This effect size is much smaller than the 40% reduction touted in the New York Times article, but it is nevertheless a very impressive result that strongly confirms the health and economic benefits of improving financial access to long-acting contraceptives. The estimates imply a cost per teen birth avoided of around $25,000, which is a very good buy considering that the lifetime Medicaid and social services spending associated with teenage births are considerably higher. Moreover, this result probably gives us a more realistic projection of what impact we might expect from full implementation of the ACA’s mandate for first-dollar health insurance coverage of all evidence-based contraceptive options. The disappointing news is that Colorado’s legislature so far has failed to pass a bill that would provide continued funding for the Colorado Family Planning Initiative, which has been supported to date through private philanthropy. The patchwork of federal, state, and local funding mechanisms for family planning services generally does not pay for LARCs despite their effectiveness and their beneficial economic spill-overs on other publicly-funded health and social programs. Medicaid coverage and reimbursement policies discourage many private providers from offering LARCs to their Medicaid patients, and insurer exemption and compliance issues continue to blunt the impact of the ACA’s private health insurance coverage mandate for LARCs. So for now, the sustainability and spread of Colorado’s innovation in family planning remain to be seen. Do Public Health Investments Crowd Out Population Health? A new paper out by James Marton, Jaesang Sung, and Peggy Honore estimates the health effects attributable to public health spending by exploiting a unique public health financing mechanism used in the state of Georgia. The results are quite surprising, and contrast with prior studies that have examined this issue. I posted a critique of this paper on the Health Affairs blog yesterday, offering a cautionary note about the measurement and analytic strategies used to estimate the health and economic value of public health investments. I will be hosting a roundtable discussion on these methodological issues at next week’s AcademyHealth Annual Research Meeting (ARM), as part of the Public Health Systems Research Interest Group meeting. I invite you to weigh in on this discussion by posting comments here and on the Health Affairs blog, and by joining us at the ARM meeting in Minnesota.